Serving Whose Interests? 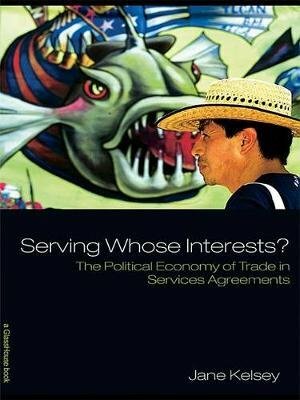 explores the political economy of trade in services agreements from a critical legal perspective. The controversy surrounding the General Agreement on Trade in Services (GATS) and its variants at the regional and bilateral levels can, it is argued, be seen as a clash between two paradigms. For most of the twentieth century, under welfare states and state socialism, these services were viewed from a local and national perspective as embodying a mix of economic, social and cultural dimensions and were managed by the state through strong regulation and direct ownership and delivery. That socially based and state-centred approach has been progressively displaced since the 1980s through neoliberal policies of privatisation, deregulation and liberalisation, the transnationalisation of finance and production, and new technologies. The internationalisation of services markets has thus become a driver of contemporary capitalism. The explicit aim of `trade in services' agreements is to lock in national regulations and policies that enhance the profitability of international services markets. They are exclusively the tools of contemporary global capitalism, yet are represented as the new pathway for development. It is argued here, however, that there is a fundamental contradiction between the global market model and the intrinsically social nature of services, whether they are social services like education, media and midwifery, or inputs to capitalist production such as finance, transport, energy, and telecommunications. This book examines and draws out these tensions and contradictions through a combination of theoretical analysis and a series of truly global case studies that include the market in internet gambling, education, pensions, electricity privatisation, supermarkets, tourism, oil, culture, temporary migrants, private finance initiatives and call centres. The product of extensive research by an internationally renowned expert in the area, yet written in an accessible manner, Serving Whose Interests? combines a technical and political analysis that will be of interest to informed trade specialists, academics and students working in the areas of international trade and international trade law, and others with interests in the organisation and regulation of the global economy.